Scotland has led the way in highlighting the inadequacy of the UK Government’s response to the refugee crisis and has established a multi-agency Refugee Operation Task Force comprising local government and other stakeholders who are working to ensure services across Scotland are ready to welcome refugees into our communities. Scotland has shown that it stands ready to take its immediate fair share of refugees from the current crisis with the majority of Scotland’s councils, faith groups, community organisations, schools and ordinary citizens offering to help. Scotland’s Minister for Europe, Humza Yousaf MSP, has welcomed the huge surge of solidarity with the men, women and children caught up in this refugee crisis, as the overwhelming offers of support continue to pour in from across Scotland. “UNHCR welcomes the important expansion of the UK’s resettlement programme for Syrian refugees announced earlier this week. Scotland has a long, proud and rich tradition of welcoming refugees. UNHCR, the UN refugee agency, recognises the leadership of the Scottish Government in establishing a task force to look at this humanitarian crisis. Mr Yousaf has also called on the UK Government to follow the Irish example and opt in to help our neighbours and European partners cope with this humanitarian crisis. The First Minister has also made it clear that her suggestion that 1000 refugees come to Scotland should be seen as a minimum and very immediate figure, not a limit and not spread over 5 years. Scotland will, she says, be happy to take 10% of the total number coming to the UK. Earlier in the month, on 9th September, the SNP Group at Westminster also used its first Opposition Day debate to call on the UK Government to do more to help refugees from the Middle East. SNP join with STUC to fight the draconian Tory Trade Union Reform Bill and to form a progressive alliance against the austerity agenda. The Scottish Trades Union Congress (STUC) has become the first external organisation to be invited to address the Scottish National Party’s group of 56 MPs at the Westminster Parliament. The meeting followed the SNP’s strong opposition to the Tory government’s deeply regressive Trade Union Bill during its Second Reading on Monday 14th September. SNP MPs had submitted a reasoned amendment which would have denied the Bill a Second Reading but the amendment was not selected for debate. SNP MPs turned out in force, however, to speak out and vote against the Bill. The Bill seeks to impose higher voting thresholds in strike ballots, to end the ban on the use of agency workers during strikes, and to introduce restrictions on picketing and protesting that even one Tory MP (David Davis MP) described as reminiscent of Franco’s Spain. The approach being taken by the UK Government is in stark contrast to the partnership approach to good employment practice being taken by the SNP Scottish Government. The proposed legislation also takes no account of different practice in the devolved administrations. “The SNP group left me in no doubt as to the strength of their opposition to the Trade Union Bill and that we agree that it is vital to unite in opposing the UK Government’s austerity agenda. EU regulations require the UK Government to use objective and non-discriminatory criteria in sharing out EU farm payments. Despite this, the UK Government chose to spread the dividend across all 4 parts of the UK meaning that Scotland received just 16.3% of the €230 million funding even though it was primarily meant for Scotland. Ian Blackford, MP for Ross, Skye and Lochaber, and Calum Kerr, MP for Berwickshire, Roxburgh and Selkirk have both raised the issue in the House of Commons but the Government has responded that there will be no review until 2016. “It is demonstrably clear that the EU gave these convergence funds to the UK in recognition of the low level funding that Scotland currently receives. “These funds are predominantly meant for Scotland’s crofters and farmers and this needs to be urgently reviewed. “SNP MPs met with representatives from the National Farmers Union of Scotland in Westminster this week and it is clear that the industry faces many pressures in terms of funding and pricing. The SNP has highlighted the fact that Westminster’s decision to impose tuition fees on students south of the border, rather than have government funding of fees, is having a serious negative impact on Scotland’s budget; yet another powerful reason why full financial powers should be in Scotland’s hands. In answer to a Parliamentary Question from SNP MSP Linda Fabiani, Deputy First Minister John Swinney pointed out that, as a result of UK Government cuts of £3bn to teaching grant spend in England, Scotland’s budget could be hit by a cut of around £298m. The SNP Scottish Government has protected the right to free university education based on the ability to learn rather than the ability to pay – in stark contrast to the situation south of the border. 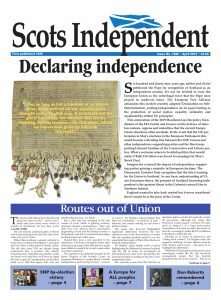 “Westminster’s £9000 tuition fees south of the border have been an unmitigated disaster in every respect – increasing student debt and costing the taxpayer more in the long run – and now we know that it could cost Scotland as much as £300million despite the policy being rejected time and time again by the Scottish people. “£300million is a serious cut at a time when public services are already suffering as a result of Tory austerity policies – and the fact that this cut is a result of the shameful imposition of tuition fees by the UK Government simply makes matters worse.